Wonder how I made my "Wonder Woman"? I was so invigorated by all the love and support I've been getting in these last few weeks, for my business and for my newest "upside down" piece, as Jim and I call them. 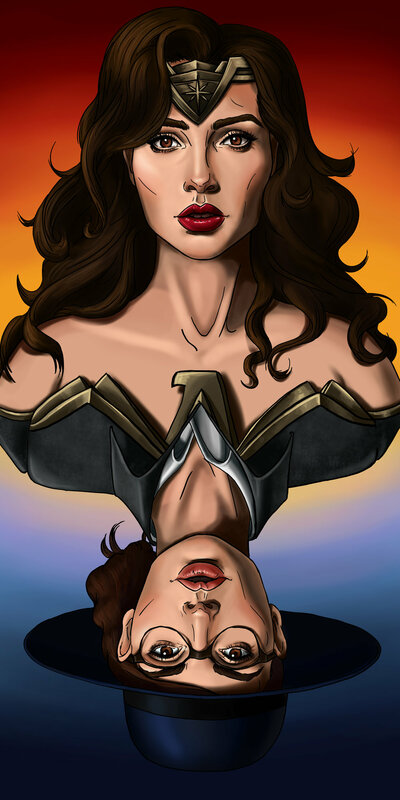 The "Wonder Woman" upside down was a real challenge as I actually started the piece last year and gave up on it for some time. I was in a dark place with my career, unsure of how to proceed and what to strive for in regards to art and life. I had just quit my job, left my school, moved to LA, and given myself the task of making art my one source of income. Did it work? NO! Wanna know why? I didn't change ANYTHING. Change is NOT bad. I just went back to regular (normal, lazy, not worthwhile days) without guiding that energy it took to get through a regular day (which is a lot of energy actually, when you're worried and have no security) toward something that will actually grab attention and cause you to have newer and bigger problem. That lack of change is bad. So that's the why, no change. No REAL change. I changed all those things in my life: my location, my income, my group, my safety net; I did not however change the amount of action I took in regards to art. I repeat I changed all those things listed above, but I did not change the amount of action I took in regards to art. "So what did change that made you happy?" I started making more art in days than I did in months. I've been promoting more in two weeks that I do in six months. And I doubled my income this week. (Keep in mind I'd only finished the book 5 days ago and all this has happened. I'll check in next week to tell you what other great things have happened to prove to you that this works.) Best of all I'm not scared anymore. I've made it my responsibility to make this go right and not wait for someone to come along and hand it to me. Because 1) they wont, and 2) I'm no longer willing to wait. So, before I get ahead of myself and try to explain the whole book to you (which I won't, just go buy it), this post is about how I made "Wonder Woman". Step 1) Based on images of Gal, I made this template sketch that I would then ink over. Step 2) I inked the image to my liking (or so I thought, this would actually change a lot along the way. Notice the hat is too high and the lips are a little to large and wide. I also a base color on it's own layer for the skin and then added the form and cast shadows. Form shadows are those that are made by light circling around a form until it can no longer reach the other side. These shadows are soft and give you an idea of how 3D an object is. Cast shadows are shadows that fall on an object because something is blocking the light, say a nose, or an eye lash, or a street sign casting a shadow on the street, see? Cast. I then added the warm parts of the skin, where is naturally flushes, and the highlights. Step 3) I added the detail of the face in the same way I did the skin. For eyes: I do the base color, the cast and form shadows and then the highlights. Same for lips and the hair. Then I added the clothing and followed the same pattern. Step 4) I then changed the background. It definitely needed it. I added the clothing in the same process as before: ink layer, color base, form shadows, cast shadows, highlights and then details. I also did my editing at this stage. I took the lips down a notch, and the highlights and edited the shadows. Also for fun and to give you all some hope, I made this Wonder woman piece in June 16, when I was still getting used to my wacom products. Practice does pay off. ← You need to be everywhere.